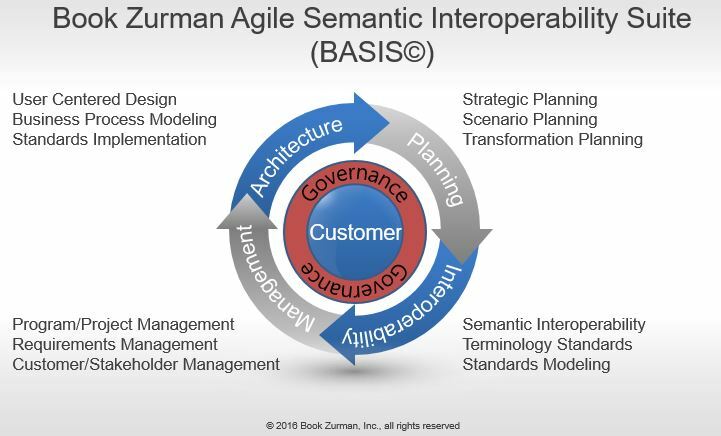 BookZurman crafts customized client solutions using our proprietary BookZurman Agile Semantic Interoperability Suite (BASIS©) Framework. The BASIS© Framework is a collection of advanced, comprehensive system development and program and project management strategies, which are developed from a compound foundation of industry-standard methodologies expertly employed using our teams’ varied knowledge and expertise. BASIS© draws from and builds upon key elements of the IBM Rational Unified Process (RUP), PMI’s Project Management Body of Knowledge (PMBOK), Agile (Scrum, XP, CD) iterative development frameworks and DevOpps methodologies. Business process re-engineering (BPR) is the analysis and redesign of workflows within and between enterprises in order to optimize end-to-end processes and automate non-value-added tasks. At BookZurman, we create partnerships with our clients , and highlight our clients knowledge and expertise about the components related to their business. We act as a collaborative partner willing to drive the strategic process. We focus on holistic approaches encouraging large-scale re-engineering of processes. We know how complex Healthcare IT Enterprise systems can be to implement correctly, maintain efficiently, and interconnect among appropriate standards. At BookZurman we're committed to crafting Service Oriented Architecture-based systems on a secure, scalable, interoperable and dynamic platform with end to end visibility and manageability. We include robust IT governance, standardization, and the most sophisticated software and information infrastructure. At BookZurman, our performance excellence in service and operations management is driven by our vast experience with commercial and governmental IT operations, and our commitment to and experience with ITIL (Information Technology Infrastructure Library) and CMMI Level 3 procedures. We adhere to interoperability as a crucial component that encompasses data standards, follows a Service Oriented Architecture, and highlights a commitment to open standards. We focus on crafting robust architecture that functions as a service to other applications. At BookZurman we thrive on analyzing, addressing, implementing and monitoring project and program management solutions. No matter your project or program, we have dedicated individuals willing to work with you to ensure the highest quality solutions and management. All of our project and program management strategies and approaches have been tested and are used at our company. Team BZ collaborates with federal government partners such as the VA, and external partners such as the National Information Exchange Model (NIEM), ONC which oversees the EHR Meaningful Use Certification Program and the Federal Health Architecture (FHA) office which oversees the Federal Health Interoperability Modeling and Standards (FHIMS) initiative. We also support open-source tooling, health information modeling and health standards architecture. Clinical Decision Support (CDS): Provide subject matter expertise on CDS to internal and external collaborators, and supports design and implementation of current and future CDS strategy by identifying and exploring CDS capabilities needed to optimally support patient care. Informatics Architecture: Define strategy and architecture as it relates to representation of patient-specific clinical data and knowledge within health information systems and with technical methodologies used to process data for patient care, quality assurance, and secondary uses. Standards and Interoperability: Provide expert health standards development engagement and consultation, contributing to a common framework for functional and semantic interoperability by sharing requirements and supporting solutions to achieve intelligent health information exchange that extends to enhanced patient care. Meaningful Use: Facilitate the process of certifying EHR System according to the Office of the National Coordinator for Health Information Technology (ONC) certification criteria, to support the demonstration of meaningful use of Health Information Technology by providers and hospitals.